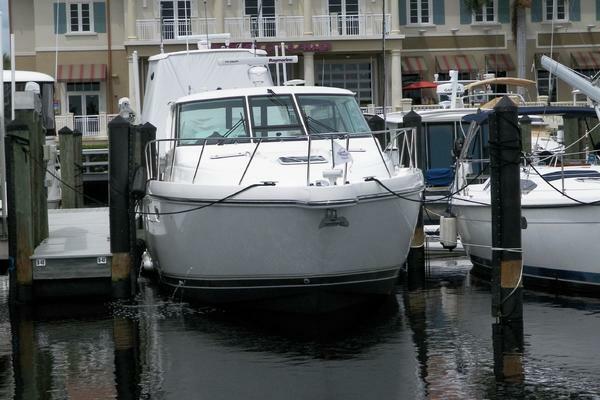 This new to the market 47 Marine Trader "IDGARA" is turn key and ready to cruise through the Great Lakes or the Bahamas. Cruise with the confidence of twin Cummins engines and an electronics package at both helm stations. IDGARA'sowners fitted her out with the best equipment for being on the hook or cruising the loop.Enjoy friends and family with the privacy of a double stateroom and the convenience of two heads.Relax in the salon in front of the LG Flat Screen TV or enjoy the tunes up on the Mezzanine deck sipping on a cocktail watching the sun sink into the horizon.Satellite TV system keeps you in touch on flat screen in comfortable salon, master, or aft deck?. Although there are only two TVs you can easily move the state room TV up to the connections on the aft bar. Also on board is the extra LNB that will give you satellite TV reception in South America waters if you wish.Fish, dive, kayak and swim from a well furnished cockpit fitted with a swim platform and dive ladder.Prepare a gourmet dinner with the day's catch in your full galley and dinette.This boat has it all! United Yacht Sales New Jersey would love to guide you through a personal showing of this 47' Marine Trader Tradewinds Cockpit 1990. 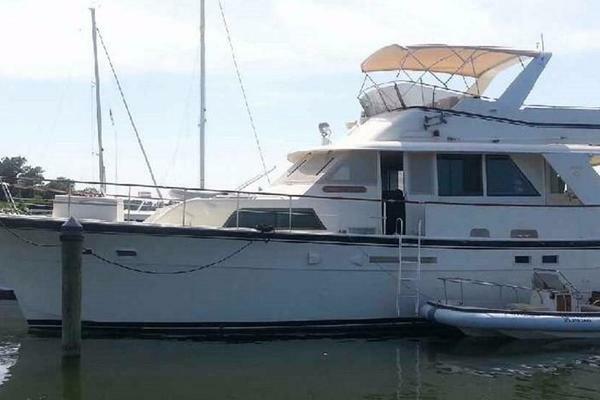 This yacht for sale is located in Marathon, Florida and priced at $129,000. For a showing please contact us by filling out the form on this page and we will get back to you shortly! The fully equipped galley is located starboard in the lower salon area and a full size dinette is portside. The galley is furnished with a deep rectangular S/S double sink, a new Isotherm Dual Compressor fridge/freezer, and a rebuilt Princess stove & oven.The Isotherm was installed in 2017 and is the best replacement for a cruising yacht.The stove/oven was completely rebuilt in 2014.There is beautiful wooden cabinetry throughout the galley and dinette area to store all the essentials. The master stateroom is nicely sized and full of beautiful woodwork and natural light.Located aft of the salon, the master stateroom features a full size king bed with nightstands both port & starboard.There are double hanging wardrobes along with plenty of cabinets and drawers for all your clothes and necessities.Port, Starboard, and stern porthole windows give the room plenty of beautiful natural light.The master stateroom also has a private head with a separate enclosed shower. The guest stateroom is located forward of the galley just past the guest head.It features a full bed with storage underneath and a hanging wardrobe.The guest stateroom also has port and starboard porthole windows and recessed ceiling lights. IDGARA has a large salon mid-ship with room for a full size sofa and chairs, a wet bar, and an entertainment center to keep you and your guests comfortable.At the main helm the salon has a starboard sliding door for easy access to the bow or stern when docking. The mezzanine deck has a beautiful teak sole.There is a wet bar and stereo system.There is plenty of room for your choice of seating here whether it be a table and four chairs or lounger type seating.It is enclosed with Isinglass.There is a ladder down to the cockpit. A beautifully equipped cockpit will help you to truly enjoy the waters around you on your voyages.You can effectively fish and clean up the mess without leaving the cockpit using the nice sized filet table with a sink just to the starboard. You can even cook the day's catch on the West Marine S/S gas grille with a 20 lb steel LPG tank. There is a very large in deck storage compartment for lots of gear or spare parts.There are several hanging racks for drying mops and brushes or hanging docklines for easy access.Slip through the transom door and out on to the swim platform for a dive and easily re-enter the boat with the removable dive ladder. The Flybridge on IDGARA is complimented by a full electronics package and complete set of engine gauges and controls.The Clear to See panel installed in 2014 helps keep an eye on all pumps and water levels for enhanced peace of mind.The owner replaced the canvas Bimini Top with a light weight hard top for better protection in 2015 andthe wrap-around Isinglass enclosure was replaced in 2016.IDGARA has seating for 7 in the Flybridge with 3 captains chairs and 2 L-shaped loungers with storage underneath.